Miss Gallipolis In Lights Samantha Burris, pictured at right, and Miss Teen Gallipolis In Lights Mackenzie (Kenzie) Long, will “flip the switch” and illuminate City Park. The Gallipolis In Lights Park Lighting festivities begin at 5:30 p.m. with the lighting set to start at 7 p.m. at the bandstand on Wednesday, Nov. 21. Miss Gallipolis In Lights Samantha Burris, pictured at right, and Miss Teen Gallipolis In Lights Mackenzie (Kenzie) Long. GALLIPOLIS — Two young ladies have an important mission to accomplish when they turn on the Christmas lights in Gallipolis City Park on Wednesday, Nov. 21. Miss Gallipolis In Lights Samantha Burris of Vinton and Miss Teen Gallipolis In Lights Mackenzie (Kenzie) Long, of Bidwell, will “flip the switch” and illuminate the night sky. Having such a coveted role in what has quickly become an important holiday tradition, is just one of the perks for the title holders. Burris, 17, lives in Vinton and is a senior at Gallia Academy High School. 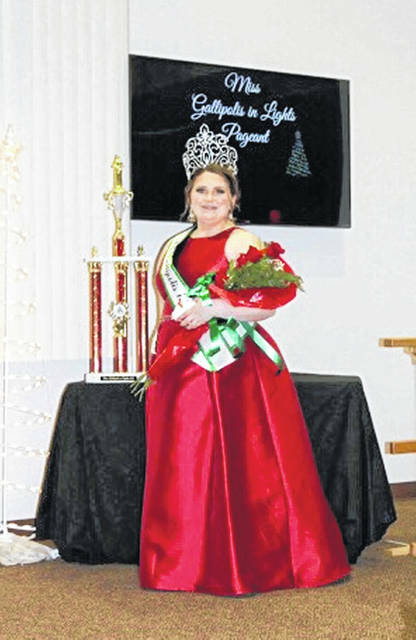 Miss Gallipolis In Lights is her second title, having been second runner-up in the 2017 Miss River Recreation Royal Court. “River Rec” was her first pageant and though she gave up her title this past summer, she said she wanted to next go for Miss Gallipolis In Lights because it would give her even more opportunities to spend her time in the community. Both young ladies have grown up with Gallipolis In Lights and it represents something to them beyond the displays. Long is 15 years old, a sophomore at Gallia Academy High School and member of student council. This was her fifth pageant and second time competing in the Gallipolis In Lights event where she took the teen title this year. 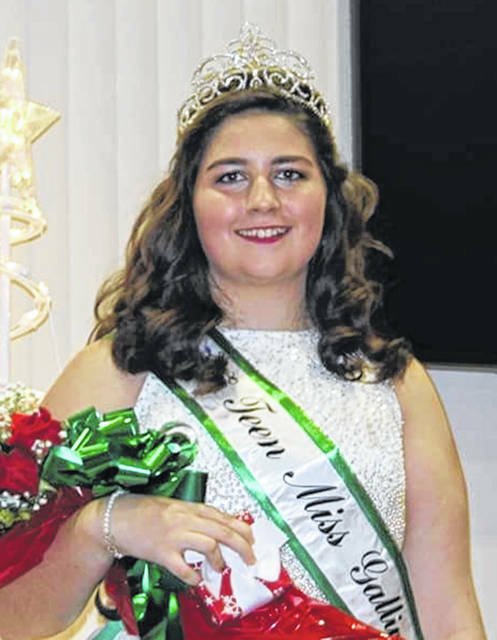 Long said, though she enjoys competing in pageants, Gallipolis In Lights is special to her and her family. Memory trees are part of the tree walk, of which there are well over 200 this year within the Gallipolis In Lights display. Long and her mother Angie said their family has been placing a tree in memory of Kaylee, a third grader at Rio Grande Elementary, since Gallipolis In Lights began. Kenzie and Angie said Kaylee’s tree was the first “in memory” tree ever placed on the tree walk. “It’s really special to us,” Kenzie said about the tree and Gallipolis In Lights. As for the big moment when she helps turn the lights on, Kenzie agreed with Burris in that she was nervous but excited. “It’s going to be a great view of the fireworks,” she said, looking forward to taking it all in from the bandstand. Since becoming Gallipolis In Lights royalty, Burris and Long have helped make light balls at the community workshops and have assisted in the decorating of the park by being available last weekend for the tree walk, helping those who were putting up trees with supplies, information and a hand to anyone who needed it. The duo will also be in the Gallipolis Christmas Parade on Dec. 1 and will be attending the Gallipolis In Lights Gala on Nov. 29 as guests. The pageant is under the direction of Darrien Miller. The Gallipolis In Lights Park Lighting festivities begin at 5:30 p.m. with the lighting set to start at 7 p.m. at the bandstand. 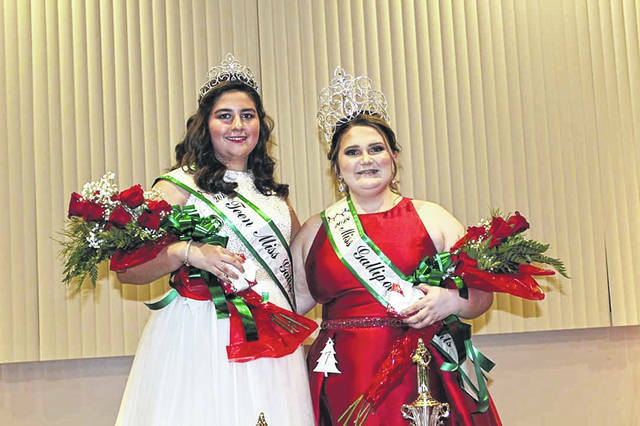 https://www.mydailytribune.com/wp-content/uploads/sites/42/2018/11/web1_11.21-GIL-1.jpgMiss Gallipolis In Lights Samantha Burris, pictured at right, and Miss Teen Gallipolis In Lights Mackenzie (Kenzie) Long, will “flip the switch” and illuminate City Park. https://www.mydailytribune.com/wp-content/uploads/sites/42/2018/11/web1_11.21-GIL-Duo-1.jpgThe Gallipolis In Lights Park Lighting festivities begin at 5:30 p.m. with the lighting set to start at 7 p.m. at the bandstand on Wednesday, Nov. 21. Miss Gallipolis In Lights Samantha Burris, pictured at right, and Miss Teen Gallipolis In Lights Mackenzie (Kenzie) Long.